Ashingdon, as many know, is the reputed site of the Battle of Ashingdon at which the invading Danes under King Cnut defeated the Anglo-Saxon armies of Edmund Ironside. The site of the current church at Ashingdon Minster church is claimed to be the place where Cnut built a church to commemorate those slain in the battle. 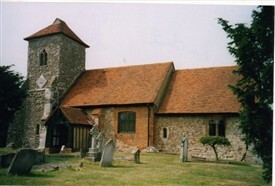 This church was, in turn, built on the site of a Saxon church dating from c. 970AD. 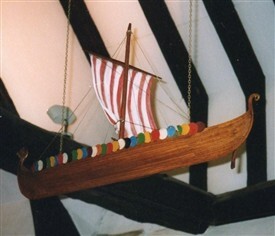 Suspended from the roof of the church is a model of a Viking longship, donated by the people of Denmark (who also donated money for repairs to the roof inside the nave). The Prince of Denmark attended the consecration service and presented the church with a Danish flag. This page was added by Helen Barnard on 31/03/2011. I think the actual site of the battle was a slight mound where Scaldhurst farm is now. At that time the tide would have covered the flood plane and the armies would probably have arrived by boat. Any bit of higher ground would have been fine for a scrap but a church site would need to be more secure and visible.